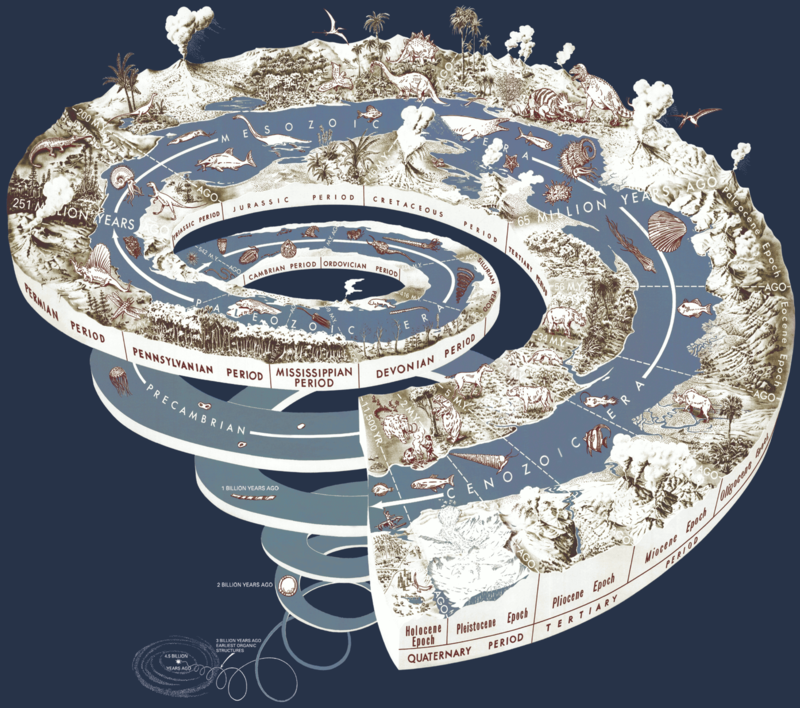 Some of the names given to periods of geological time are familiar. The Cretaceous says dinosaurs, chalk and lots of extinctions. The Pleistocene, wolly mammoths and glaciers. The Cambrian, a very very long time ago. Others are more obscure. Who but the most committed of palaeontologists has ever heard of the Gelasian, the Bajocian or the Serpukhovian? How do geologists come up with these names? Historically, the units of time were often named for the locations of key stratigraphical sequeneces. That’s why there’s a particularly British flavour to the list – the Oxfordian, the Devonian, the Cambrian. Now, such is the influence of humans on our climate that, for the first time, geologists are considering declaring a new segment of geological time – one caused by human activity. Our newest Special Publication, ‘A Stratigraphical Basis for the Anthropocene‘, summarises the evidence that we’re now living in a new geological epoch – one of our own making. The word ‘Anthropocene’ was originally coined by ecologist Eugene F. Stoermer in the 1980s, and since popularised by Nobel Prize winning chemist Paul Crutzen. “The new volume analyses the hurdles the Anthropocene will need to overcome if it is to be formalized by the geological establishment” says editor Dr Jan Zalasiewicz in a University of Leicester press release. If we are living in the Anthropocene, when did it start? Currently, we’re officially in the Holocene – an epoch which began at the end of the Pliestocene, 11,700 years ago, characterised by a stable, relatively warm climate. Some argue the Anthropocene began with the industrialisation of the nineteenth century; others, that it is a post war phenomenon, beginning not more than 70 years ago. What do you think? Should we be establishing a new epoch? And what would you have called it? Find out more about the Anthropocene on our website. Tags: anthropocene, climate change, environment, geology, history, publication. Bookmark the permalink. Previous post ← The Great Geobakeoff – the results! 2) One way or other, the Anthropocene is not sustainable on geologic time scales. We will either reach a sustainable equilibrium favorable to us, or one without us. So it will be just a blink of an eye, even more so than the Holocene. That isn’t to say that the Anthropocene isn’t a useful concept. But it is an event, not a time unit. It is comparable to the Paleocene-Eocene Thermal Maximum, or the Permo-Triassic Extinction event, or the Messinian Salinity Crisis. These are important transformative geological events, but they are not brigaded off as their own recognized chunks of geochronology. I have to agree. literally and figuratively the dust hasn’t settled on the anthropocene. I also agree with Thomas. Ever since I first heard of the proposed Anthropocene I have considered it to be a conceited notion. I believe our impact on the globe will feature as nothing more than a time horizon. If not then let it wait for future generations to add the Anthropocene to the geological time scale, give it say, a few hundred thousand years.